EAT.DRINK.THINK. 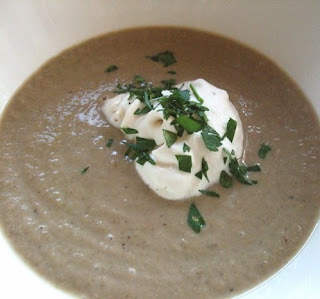 : Hazelnut and Wild Mushroom Soup: can you hear fall calling? Hazelnut and Wild Mushroom Soup: can you hear fall calling? Could my life be any better on this warm autumn afternoon? Sitting here watching my beloved Cubs in game 1 of the playoffs on their inexorable march to their first World Series title in 100 years. Sipping an ice cold Lagunitas IPA while giving you yet another killer way to satisfy your endless hunger for good food. It's good for me, it's good for you. The karmic wheel is spinning just fine, thank you very much! So what do I have to bestow upon you? Only one of the best soups you have ever had in your otherwise fulfilled lives. I blogged this mushroom and hazelnut soup a couple of years ago, but since then there are thousands more regular eat.drink.think. readers, so it absolutely bears repeating. I first got this recipe from our local sustainable living magazine ediblePortland. I've done it three times since, the last time just this past Sunday as a soup course prior to an insanely good grilled leg of lamb. This also happens to be an easy, fabulously seasonal bowl of deliciousness that takes advantage of fresh fall hazelnuts and the seasons first wild mushrooms. Very rich, but not over the top, with exquisite nuttiness that merges perfectly with the earthy mushrooms. The mushroom stock recipe that I think is essential (as opposed to the optional chicken stock) absolutely makes this dish and would be an excellent base for other soups, or added to a wild mushroom risotto. Topped with a dollop of sherry or marsala whipped cream, this is elegant, satisfying and I guarantee your guests will swoon. That is if you decide to share! Preheat oven to 35o degrees. Toast the hazelnuts for 10 minutes until they are lightly toasted and their skins begin to crack. Remove from oven and put hazelnuts in clean dishtowel. Rub vigorously to remove as much skin as possible. When cool, grind the nuts in a food processor and set aside. Melt the butter in a saucepan. Add the shallots and garlic and cook until translucent. Add the mushroom slices and sauté 10 minutes, stirring frequently. Deglaze the pan with sherry or Marsala. Add the mushroom stock and season with salt and pepper. Reduce the heat and simmer for about 15 minutes. Puree the soup and nuts together in a food processor or blender (see notes at bottom) in batches- process a long time until the hazelnuts are completely smooth and integrated into the soup. Whip the cream, and add the sherry or Marsala. Serve dolloped on top of the hot soup and sprinkle with chopped herbs. Heat the olive oil in a large 4 quart saucepan. Add the onion, carrot, celery, and leek and sauté over medium-high heat until the onion is well browned, about 15 minutes. Add the mushrooms and sautée another 5 minutes. Add all the remaining ingredients and bring to a boil. Reduce the heat to a simmer and cook, partially covered for 45 minutes. Strain through a sieve. I've never been a huge fan of mushrooms, but I think you are right on with the sherry; it is the only thing that has turned me on to any sort of mushroom soup. I am intrigued by the hazelnut addition, though. I've never been much into those, either, but maybe there will be something about this combination that takes it up a notch for me. erik...i know what you mean. sherry (or marsala) provides the perfect "lift" to mushrooms. And I also thought the combo hazelnut-mushroom was so different, but it really works well together. You wouldn't think, given that colour, but Mushroom soup is the best. gk....much like meatloaf, mushroom soup never really looks that good in photos for obvious reasons, but tastes fabulous.Can you imagine that without the marsala cream and parsley how much this would look like something either fed to or expelled from an infant?! Hey, I gave this the old college try. I'm a fairly adept cook but haven't really made a nut soup before. I found the final product perfect for mushroom-ness but gritty. a bit too crunchy. Should I just buzz the living hell out of this in the cuisnart until it's just smooth as cream? widee...you need to blend the holy hell out of it. That's why a blender works so well. Not sure when you left this comment, but thanks, and def worth another try to make again! Vacation reading: Lost in Absurdistan! That IS enough to make a maverick holler! Wild Mushroom Pasta: lusciously local! Art? Science? Food? Yes. Yes. And yes! Cashew Chili: no meat, no matter! "You want it your f*ckng way?!" Casino Cockatil: the reward system! Mapo Tofu: the 2nd time is the charm! A toast to well being! Sicilian Sundays @ Apizza Scholls!